KATHMANDU, May 20: Migrant workers including thousands of Nepalis continue to face serious abuse and exploitation in Qatar 2022 World Cup construction sites, Amnesty International has said. Qatar is a home to an estimated 400,000 Nepali migrant workers many of whom work in the World Cup construction sites. In a statement issued on Friday, hours before Qatar displayed its first World Cup venue---- Khalifa International Stadium ----to the world, AI said that little has changed in reality for migrant workers despite Qatar's claims of reforms in discriminatory labor laws. Citing findings of an investigation it carried out a year ago, AI said that migrants working in Khalifa International Stadium had become subject to systematic labor abuse from companies involved in the renovation. The stadium was inaugurated on Friday evening - one month after independent auditors published fresh details of the ongoing exploitation of migrant workers across World Cup projects. The report documents extensive cases of appalling treatment of migrants which among others include confiscation of passport and denial of food, water and rest during work hours. "It's a year since Amnesty International exposed the exploitation of migrant workers who helped to build the Khalifa Stadium, but abuses on Qatar 2022 sites have continued," said James Lynch, deputy director of Amnesty International's Global Issues Programme. "Qatar's World Cup organizers have placed special requirements on contractors that are supposed to stop this happening, but the reality is that workers on their sites still live under Qatar's repressive sponsorship system, which gives employers powerful tools to abuse them," he added. Qatar is one of the major work destinations of Nepali workers. The oil-rich Gulf state had hired 129,038 Nepali workers in the fiscal year 2015-16. Most of the Nepali migrants work in appalling condition, oftentimes without rest and timely payment of wage. Many others are denied basic facilities including decent living, food, water and healthcare, not to mention 24-hours insurance cover and other facilities. At least 180 Nepali migrants had died in Qatar in the fiscal year 2015-16, according to Nepal's mission in Doha. 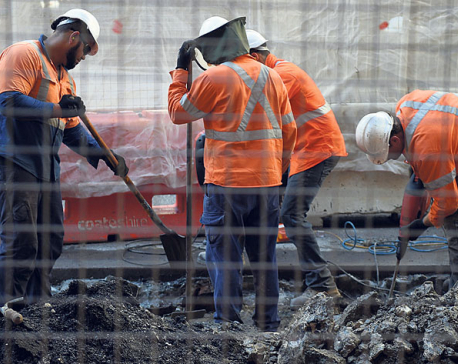 AI has said that migrant workers are at serious risk as Qatar is in process to carry out multi-billion dollar infrastructure development in the next five years.